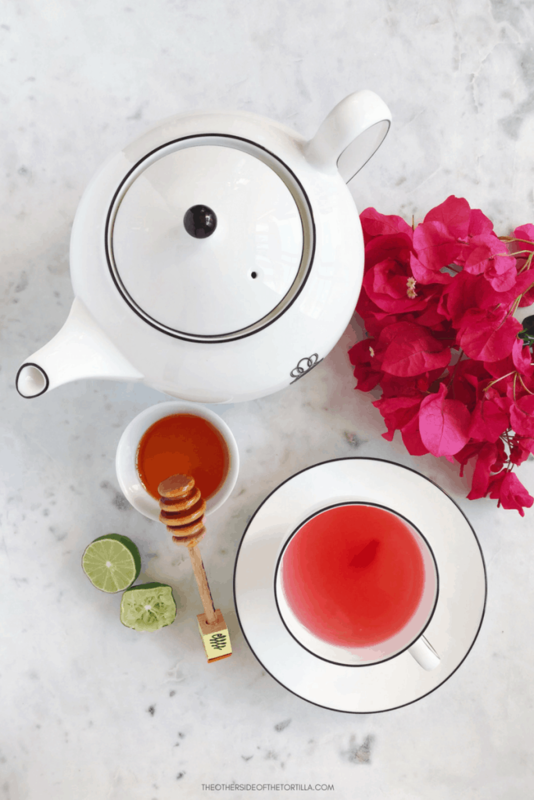 Té de bugambilia, also known as bougainvillea tea in English, is an essential Mexican home remedy during cold and flu season. It’s an excellent way to alleviate coughs, chest congestion and sore throats. Years ago on a visit to Mexico City, my father-in-law taught me how to make this very effective Mexican home remedy for alleviating coughs and sore throats. The recipe couldn’t be simpler: boil water and add the flowers until the water turns pink, then add Mexican lime juice (key limes) and honey. Some people like to add a little Mexican cinnamon stick to theirs as well, but I prefer my tea without it. Add slightly more honey if your throat is particularly sore. 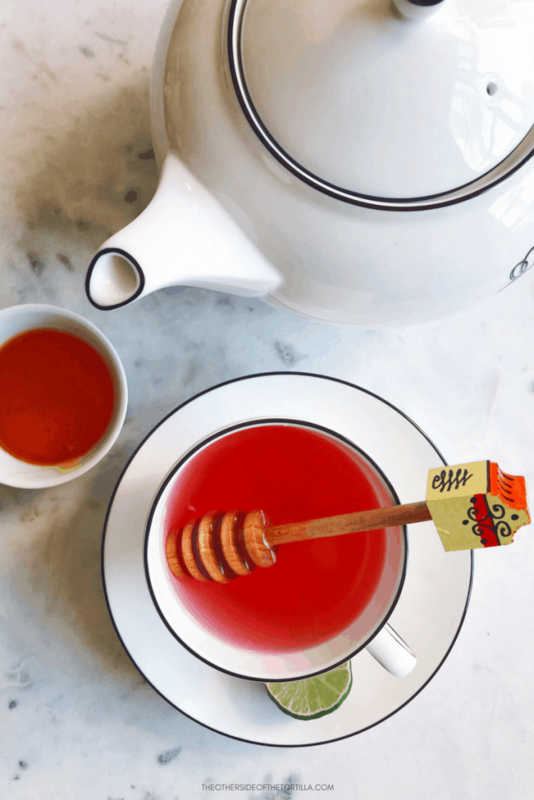 Drink this té de bugambilia 2-3 times per day while you’re sick and it will help alleviate your cough, sore throat and chest congestion. I’ve used this both in place of, and in conjunction with, typical medications prescribed when you’ve got things like flu, bronchitis, strep throat, and so on. I swear by this recipe and share it with everyone I know during cold and flu season. Fun fact about these flowers: The brightly colored parts of bougainvillea are actually leaves and the little white or yellow part in the middle (called bracts) is the actual flower! Bougainvillea leaves come in many shades: white, pink, orange, purple, magenta and burgundy, to name a few. You might be surprised to know there are more than 250 varieties of this plant, which lends to the difference of flower and color, size, and even the color of the leaves. When making this tea, I prefer to use darker colors of the flower such as dark pink, magenta (pictured), or purple. I’m not sure that it makes much of a difference in terms of effectiveness, but the darker colors allow you to see how much the flower has infused into the water to know when it’s done. Bougainvillea are easy to grow, tough, drought-resistant and pretty disease-resistant, as well. These plants do not automatically attach themselves to a fence or trellis, so they need to be “trained” in order to do so. You can use something light gage wire or string to train them to grow that way. Although these vine flowers thrive best in warm, coastal regions and have a high salt tolerance, if you live in cooler climates, bougainvillea can be successfully potted in containers and kept outdoors during the warmer months, and kept indoors as a houseplant or hanging basket once the temperature drops. Just make sure your plant gets enough sunlight (about 6 hours per day) and isn’t placed too close to cold windows during winter. Dwarf varieties, such as one called “Ambience,” grow best in hanging baskets. If you want to get really technical, bougainvillea plants thrive best outdoors in U.S. Department of Agriculture plant hardiness zones 9b and higher. The USDA has a map and a search box where you can type in your zip code to see what zone you live in. Where we currently live in the San Fernando Valley, we are in a 10a zone and we have lots of bougainvillea thriving in our neighborhood. 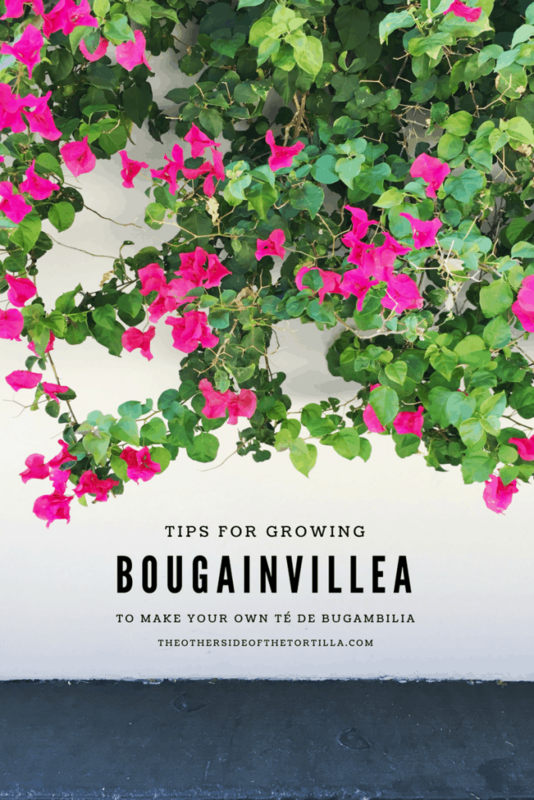 Grow your own bougainvillea plant and you’ll be making fresh té de bugambilia in no time. 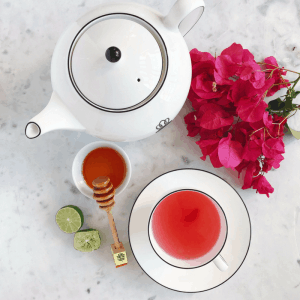 Drink this special bougainvillea tea at the first sign of a tickle in your throat and you won’t regret it. It's an essential home remedy for fighting colds, flu, and chest congestion. To clean the flowers: Make sure you remove the pistil and stamen, rinse the flowers, and gently pat dry before you stew them in boiling water to make tea. Bring water to a boil in a saucepan and add clean, dry flowers. Boil gently until the tea has turned bright pink, then strain the flowers out and pour tea into a mug. Add the juice of one key lime and a half teaspoon of honey to the mug and stir well to incorporate. The tea should look slightly cloudy with the addition of the lime and honey. Add more of each to taste if you like. If using the Mexican cinnamon stick, add it while the water is boiling, and remove it when you strain the flowers out. This home remedy recipe should not be used in place of professional medical advice if you are sick. Consult your physician if you’re feeling under the weather. I’ve always wondered about making tea with bougainvilla! I didn’t know if it was a real memory of my childhood or something I just made up. lol. Thanks for posting this!